Ecuador shares the largest known population of oceanic manta rays (Mobula birostris) in the world, with many individuals frequenting the waters off Isla de la Plata and Bajo Cope. This location represents an unparalleled opportunity to study this iconic species. However this region is fraught with artisanal fishing pressure and rising human impacts. A carefully designed action plan is needed to categorize anthropogenic threats and provide recommendations to reduce negative impacts to this charismatic ocean giant. Manta rays are iconic animals and a focal species for marine tourism. Unfortunately, as long-lived animals with low reproductive rates, their populations are usually some of the first to impacted by human pressures. Described only in 2009 and recognized as internationally threatened species in 2011 (IUCN Red List), the oceanic manta (Mobula birostris) is now the focus of intense scientific scrutiny. Ecuador and Peru share the largest known oceanic manta population in the world, with individuals being seasonally observed visiting Isla de la Plata in Ecuador's Machalilla National Park, and the Bajo Cope Marine Reserve. These locations represent an unparalleled opportunity to study this iconic and typically elusive species. Proyecto Mantas Ecuador (PME) was founded in 2010 to conduct focused research that can be used to assist in the conservation management of Ecuador's oceanic mantas. In 2011, PME supported the Ecuadorian government in submitting a proposal to list oceanic mantas on Appendix I and II of the Convention on Migratory Species (CMS). The proposal was a success, with CMS identifying them as a priority for conservation in 116 nations around the world, and highlighting the need for immediate international protection and management. With continued momentum in 2012, Ecuador further proposed both species of manta for inclusion on Appendix II of another international convention - the Convention on International Trade in Endangered Species (CITES). This proposal was also successful. Despite heightened international protection, and being granted national protection within Ecuadorian waters, the team at Proyecto Mantas Ecuador have identified that human-borne threats to this population remain extremely high - with artisanal fisheries remaining a particular challenge. A carefully designed action plan is needed to categorise these anthropogenic threats, and provide recommendations to reduce negative impacts to this species. Consequently, Proyecto Mantas Ecuador are conducting a diverse suite of research on the Ecuadorian oceanic mantas in order to develop this action plan, and have established collaborations with the Ministry of the Environment and the Department of Fisheries to aid in its progression and eventual implementation. Beyond Ecuador's borders, PME plan to extend their research collaborations west to the Galapagos Islands and south into Peruvian waters, with the hope of eventually contributing to the comprehensive management of the oceanic manta population that all these regions share. To conduct focused research which can be applied towards the comprehensive management of manta ray populations for the sustainable benefit of local Ecuadorian communities. 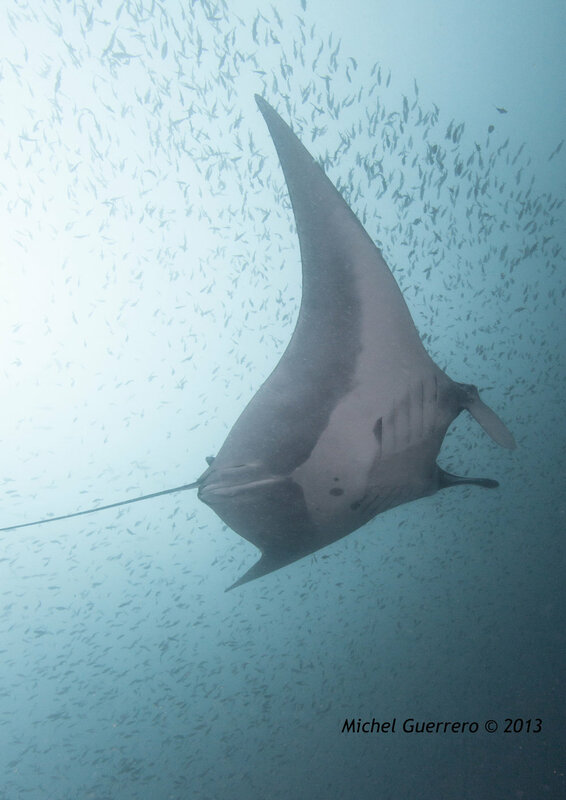 (1) Investigate the local and regional movements of oceanic mantas around critical habitats in Ecuador, through seasonal monitoring and the use of acoustic and satellite tags. The implications of oceanographic, atmospheric, and biophysical influences on the distribution and seasonal visitation of this species will also be explored. (2) Quantify and describe the human impacts on the local manta rays. (3) Deliver recommendations for reducing these threats through both local and regional management action plans, and by using Isla de la Plata & Bajo Cope as models for conflict resolution. (4) Develop education initiatives with the Machalilla National Park and the Ministry of the Environment to promote manta ray research and sustainable eco-tourism. Michel is an Ecuadorian marine biologist and PADI Course Director, who co-founded Proyecto Mantas Ecuador and Fundacion Megafauna Marina del Ecuador. Michel owns and operates Exploramar Diving, the largest and one of the most respected dive operations in mainland Ecuador. Michel has been diving at Isla de la Plata, the coast of Ecuador, and the Galapagos Islands for the last 22 years. Intrigued by the large number of oceanic manta rays at Isla de La Plata and the surrounding area, Michel set about developing research efforts into these iconic animals, and establishing a conservation program to protect what he believes is one of the greatest manta ray hot-spots in the World. Michel also instigated and co-wrote the first PADI Manta Ray Awareness Specialty. Project Co-Founders & Colleagues: Dr. Alex Hearn, Maria Gloria Landázuri. Created the largest database of oceanic manta rays in the world. Played a key role in supporting Ecuadorian government in proposing mantas for international protection (CMS & CITES). Identified the only known aggregation site of pregnant female oceanic manta rays. Demonstrate of mainland-Ecuador's oceanic mantas with those of Galapagos and Peru through the use of satellite telemetry. Establish collaborations with the Ministry of Environment and the Department of Fisheries to develop an Action Plan for the conservation management of Ecuador's mantas.